In the past ten years, much research has been done to identify efficient means to support collaborative data analysis activities. Many systems have been proposed for single- and multi-display environments in different domains. These systems enable users to explore information spaces through independent and shared views of the information space. Also, it is possible to visualize, modify, and share visualizations independently and collaboratively. Researchers have also been exploring how collaboration is impacted by the use of different technologies. Large shared displays, such as tabletops and wall displays, have major positive influence on awareness, communication and coordination of resources. When working only with individual devices, collaborators typically work independently and make more errors. However, when investigating the role of devices within MDEs for collaborative visualization activities, researchers focus on shared displays (wall displays and tabletops) or in techniques for content transfer between devices. This research extends the prior work by exploring the collaboration between pairs when the number of tablets providing different detailed views in a geospatial MDE changes during information exploration. We looked into how geospatial information can be displayed in MDEs to afford efficient support for the collaboration, and how the collaboration is influenced by the devices available in the environment. As result of our effort to explore how geospatial information can be distributed across multiple displays, a MDE called Bancada was developed. This MDE allows users to interact with multiple detailed geospatial visualizations using tablets, which are tangible zoomable lenses. A user can interact with multiple tablets, each providing a single lens (a geospatial layer), or with a single tablet providing all lenses. While users interact with tablets, a large display, such as a tabletop, provides an overview visualization (overview map), lens-based viewfinders, i.e. viewfinders showing the content of all lenses that are being manipulated at a given moment, and insets with intermediate scale views. Figure 1 shows the different views provided by Bancada. Figure 1. 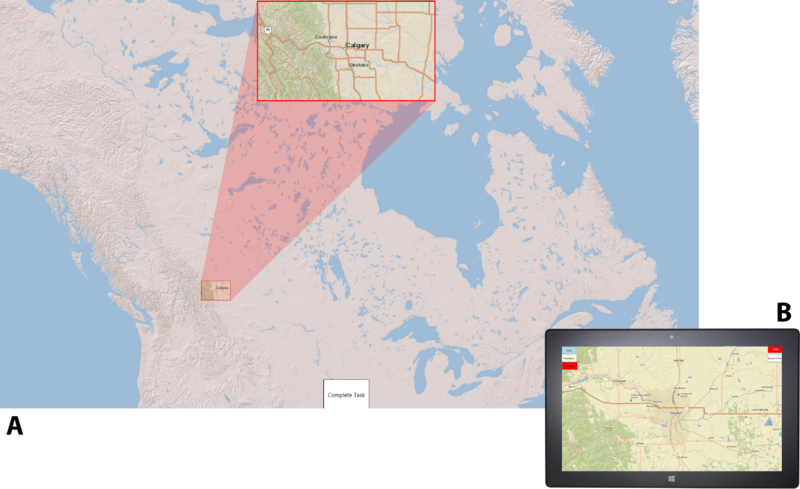 Bancada provides an overview map (A) with lens-based viewfinders and insets (upper part) according to the lenses being manipulated on a tablet (B). Bancada was used as means to conduct a study investigating the impact on collaboration of using different configurations of devices in MDEs. A configuration consists of a certain number of tablets providing different number of lenses integrated with a tabletop providing overview. Results from the study demonstrated that the number of tablets available and the lenses they provide play important roles on how groups perform collaborative activities within MDEs. The majority of collaborators demonstrated preference for when they have access to their own tablet providing all lenses, a configuration that was seen enhancing and efficiently supporting the collaboration. Francisco Marinho Rodrigues, Teddy Seyed, Frank Maurer, Sheelagh Carpendale: Bancada: Mobile Zoomable Lenses for Collaborative Geospatial Exploration. In Proceedings of the 2nd Collaboration meets Interactive Surfaces Workshop (CmIS) in ACM Interactive Tabletops and Surfaces 2014 (ITS 2014), Dresden, Germany, 2014.